Happy New Year everyone! I was kind of happy to see 2016 go. It wasn't an especially bad year for me personally but it was a bad one for a few people I care deeply about, and moving on to 2017 feels like some sort of closure. I don't know what 2017 will bring but here's to hoping for nicer things! This one is for 'the Rifle' by Alela Diane, and it's maybe one of my favourite songs of all time. The lyrics have some very clear imagery going on, but I wanted to be less literal with my interpretation. I tried to picture the idea of a threat coming from the woods by drawing a giant wolf/fox thing sneaking around a tiny house. This was one of the easiest illustrations I've done in a while, as in, the process from idea to final result was super quick, apart from agonizing over the position of one front leg for fifteen minutes and a half-hour nap. 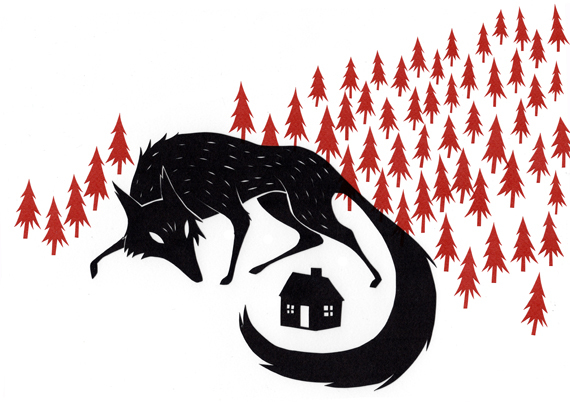 The wolf/fox and house were cut out of black paper and scanned, I then cut out around fifty little trees and photoshopped them in the background (so I had more control over the scale and could create a sense of perspective). At first I had placed the trees closer together so there would be more overlap, but this got too crowded and took away from the monster a bit.